The BOSS brackets are 6mm (1/4”) powder coated steel. Our brackets do not bend. These brackets are the end caps, therefore the end caps are 6mm steel not nylon (Airlift) or 3mm steel (Firestone). 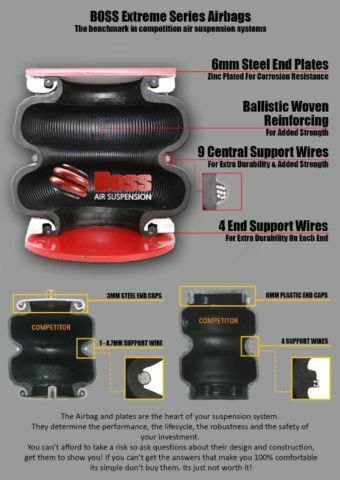 BOSS Air Suspension air bags have an operating pressure of 0-160psi all others are 5-100psi. BOSS air bags are rated at 5200lbs of lift at 100psi, but can be run at 160psi. BOSS air bag are made in their own factory, not sourced from whichever supplier has the cheapest price. BOSS uses solid brass fittings, not plastic. The fittings on our airbags are pre installed with sealant to eliminate leaks.